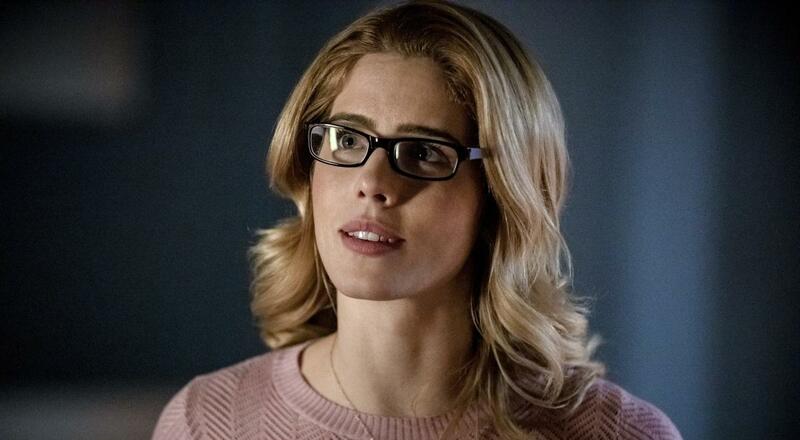 Emily Bett Rickards dropped a bombshell on viewers in a recent Instagram post where the actress, who plays leading lady Felicity Smoak on Arrow, revealed she would not be returning for the program's final season. "We’ve had the pleasure of working with Emily since Season 1 and in those past seven years she has brought one of TV’s most beloved characters to life," the statement read. "And although we’re heartbroken to see both Emily and Felicity leave the show, we’re completely supportive of Emily and her future endeavors. She will always have a family at Arrow." The show's star, Stephen Amell heard the news and offered up a temporary response on his Instagram story, "I need until Monday. For now, I love you." 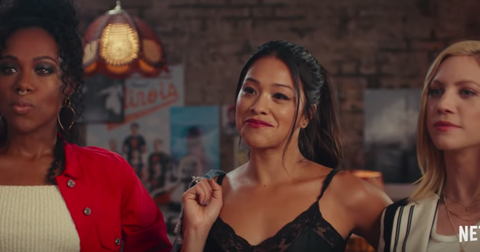 It isn't easy to lose your co-star of seven seasons out of the blue, so it's understandable that Stephen would need a bit of time to process the information. Why is Felicity leaving Arrow? Emily has not broken her silence about her decision to leave the show, but following Arrow's cancellation, Emily gushed about her time on the CW series. "Without this show I would have not met the inspiring people pictured here nor those I have gotten to work with and get to work with everyday. People who have become my family," she captioned a candid photo of the cast on Instagram. "I’m excited to see what is in store for the story we have been telling. I’m excited and nervous. A combination of emotions Felicity Smoak vibrates at frequently." She continued, "Needless to say without the last seven years I wouldn’t have met her... Thank you to all of you for your massive support, passion and accompanying us on this journey. It’s because of you we found each other." 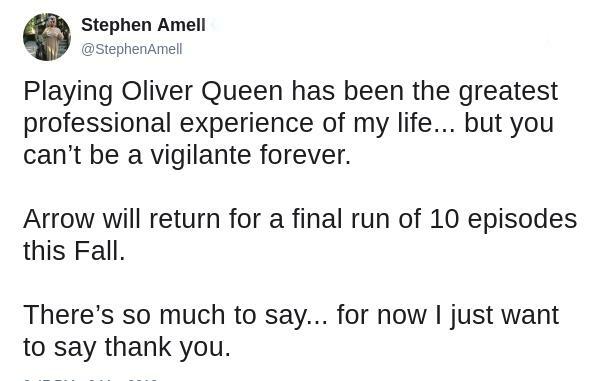 Stephen also penned a touching tribute to his co-star, adding, "For me... August 3rd, 2012 is the most important day in the history of our show. It was the first day I worked with Emily. Her energy and the vibrancy she gave to Felicity Smoak is only surpassed by what she personally gave to me. She was a co-worker that became a best friend. So on the first day of our last episode together, I’d like everyone to know how deeply I appreciate the past seven years. EmBett... We wouldn’t be here without you. I love you. And I cannot wait to see what you do next. Emily first came on the show in episode 3 — she was an IT Technician at Queen Consolidated before she ultimately joined Oliver's team of vigilantes. Now that she's leaving, it puts Felicity's whole pregnancy story arc in a weird position: will she go to the hide out in Bloomfield to deliver her child off-camera while Oliver ties up some loose ends? Or will the network get someone else to fill her shoes? This late in the game, it'd probably be a bad move. It's not like they have the budget to Benjamin Button level CGI to superimpose her face and voice on another actor, either. 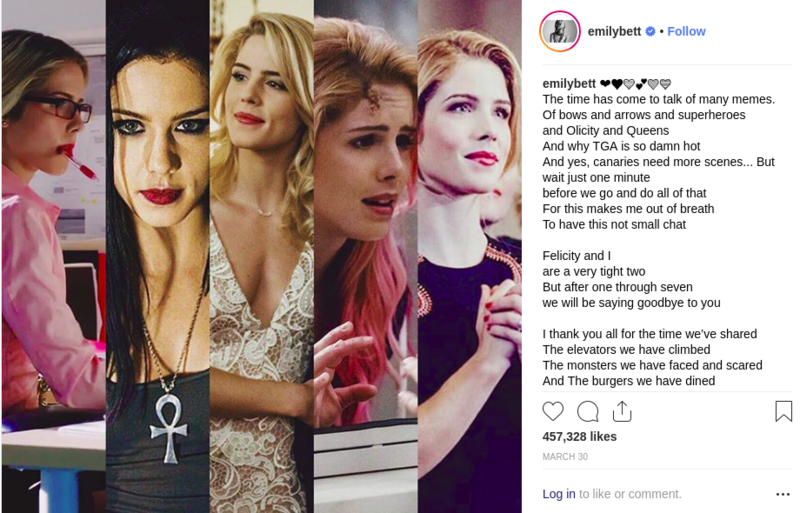 From Emily's farewell Instagram post, it doesn't look like the goodbye came from a place of enmity whatsoever: she had nothing but praise for the show and had nothing but love for the character. What about Oliver and Felicity, together? "Olicity," finally became a reality to fans in Season 6, Episode 10 of the series when the two characters finally tied the knot. Early on in their relationship, the two didn't really speak that much, with Felicity occasionally hacking into things and gathering intel for Oliver. As the series progressed however, it was clear that the two hot people found each other hot and then, well, things started happening. Romantic things (sitcom "ohooohhooooo!") 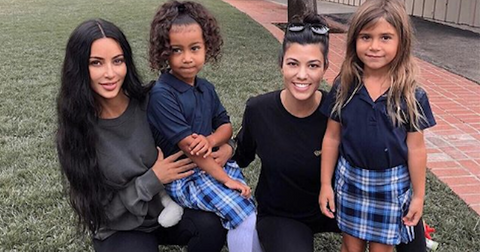 She becomes step-mom to William and three of them have a family. 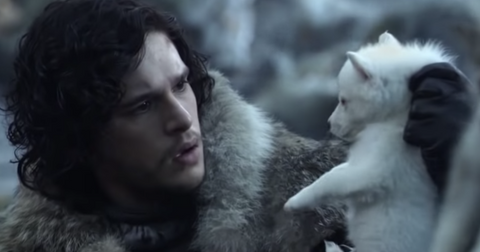 D'aww. What's going on with Felicity's daughter? Arrow fans were surprised to learn that the ruthless cage fighter Blackstar was actually the daughter of Felicity Smoak and Oliver Queen. Played by Katherine McNamara, the character's reveal was very hush-hush, so much so that the actresses auditioning for the part didn't even know who they were really playing. She most recently rescued her Mama with William on the show and her role in the final season will probably only become larger now than Felicity's gone. Arrow's final season will come to an end in fall of 2019. Anyone have any predictions as to how the show's going to end?